Like most of you, I’ve always refrained from giving my dogs alcohol of any kind (beer or mixed drinks), knowing that alcohol poisoning in dogs is serious business. But, you may not know that even ice from a mixed drink could seriously harm your dog. I’ll be honest, this is the one that I hadn’t thought about… until now. The other day, while I was perusing videos found on the Internet, I came across a number of amateur home videos that some dog owners had posted online showing their dogs in a drunken state. But it does give me an opportunity to share what I’ve learned about dogs and alcohol. For the record, alcohol always appears on the top of the list of “things that are toxic to pets”. What About “Drunk Ice” From Mixed Drinks? To be truthful… we have given our dogs ice cubes from our mixed drinks for years. You see, our dogs love plain ‘ol ice. And we have given them non-flavored ice cubes as a dog treat for years. Trust me, when I say… they eat it up! Of course, they seem to like “drunk ice” just as much as flavorless ice. But then I read this: No Drinks For Dogs! Needless to say, in the interest of being responsible dog owners, we have stopped giving our dogs “drunk ice.” Despite the fact that our dogs have never shown any ill effects from the ice, we figure why take the chance? So, if you’ve given your dogs ice from alcoholic beverages before, I simply invite you to take a step back and think about it. And… thanks for reading this. The more informed you are, the easier it will be for you to make a conscious decision that you (and your dogs!) can live with. A Reason To Never Give Beer To Your Dog! 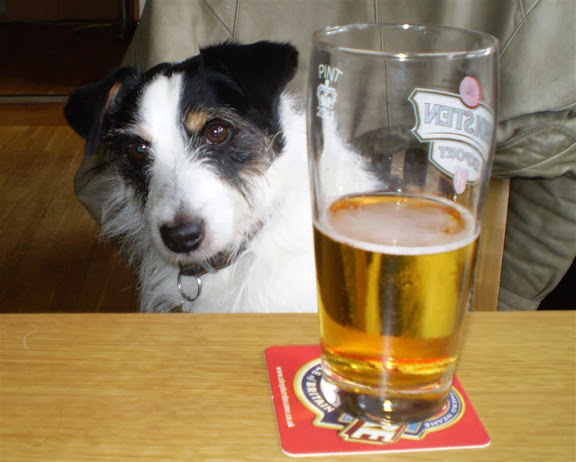 There’s only one beer you can serve to your canine friend: Happy Tail Ale. (It’s even been endorsed by Gov. Arnold Schwarzenegger.) Here’s how this dog-friendly beer got its start.